Master Naturalists continued our work improving the quality of the natural areas in Barcroft Park, with three three-hour work sessions on great-weather Saturdays in September, October and November. Our mission for all three sessions was cutting English Ivy from trees in heavily infested areas of the park. 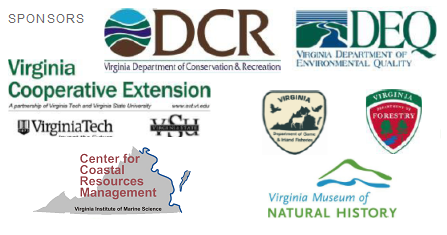 As noted in previous posts, Arlington County has contracted with a professional company to remove invasives in the park, and the work left undone following the first big assault on dozens of exotic species in May-June included the treatment of Ivy, Vinca, and Wintercreeper in the late fall. In fiscal year 2013, Arlington County allocated $100,000 for invasive species contract work in the County’s high-value natural areas, and a portion of this is being spent to complete the treatment of Barcroft Park. We volunteers are saving the County 3 – 4 contractor work days at $1,200/day by cutting the Ivy from Barcroft trees, thereby extending the County’s resources and enabling more parkland to be treated. In September, a dozen volunteers, representing Master Naturalists, Virginia Native Plant Society, Tree Stewards, and Fairlington condominiums, worked on trees in the thick bed of Ivy on top of the ridge, where for decades the Ivy had spilled out of residents’ back yards 150 feet or more into the park. Don Walsh, Tree Steward extraordinaire, completed a thorough job on a double-trunked Chestnut Oak. Following the work, most of us stayed for a leisurely botanical stroll through the park, identifying the park’s four Hickory (Carya) species, and a number of fall wildflowers, including Bonesets (Eupatorium spp.) and woodland Goldenrods (Solidago spp.). In October, we were only five, but one was a tenth-grader from Yorktown H.S. with a great interest in ecology, who did great damage to the Ivy. Before beginning the work, at the picnic shelter, we engaged a number of African-American women from a Nauck neighborhood church, who were very interested in the work we were about to do, and received our “Choking Hazard” brochures. We also engaged a staffer from Conservation International who happened to check out the area we were working in, and who expressed interest in a CI workday we may facilitate in the future. This was a day rich in connections. In November, another dozen of us worked in areas midslope below Claremont School, and along the trail up to the school parking lot. Farrah Dang, of the current MN class, was particularly gratified to finally saw through a 5″-diameter Ivy trunk supporting an infestation some 70′ up a Sycamore. Farrah and Brooke Alexander can barely be seen waving at the base of this “broccoli tree” that probably only had a few more years left before final choking. Again as in September, most of us took a leisurely walk through the park looking for plants. We identified an Elderberry (Sambucus canadensis), and the County Champion Poison Oak (Toxicodendron vernix). A little further uphill, we came upon the strange scene of a chair in front of a large rock, a nearby still-bleeding headless chicken (Gallus domesticus), and a 60′ barkless trunk severed from its stump, swinging from an Oak one foot off the ground. What could this vignette mean? All theories welcome–please post them on the blog. We wish to thank everyone who volunteered for these work sessions, with special mention of those who showed up for at least two of them: Margaret Chatham, Susan Crawford, Farrah Dang, and Don Walsh. It will take us at least one, and perhaps more sessions to complete the Ivy-on-Trees work in Barcroft Park. Join us next time on December 15th. Who knows what more mysteries, natural and unnatural, we may encounter. This entry was posted in Barcroft Park and tagged invasives, restoration, stewardship by armneditor. Bookmark the permalink.